Calendar of Events January 10-11 Arkansas Turfgrass Association Annual Conference & Trade Show Hot Springs Convention Center Hot Springs National Park, Arizona arkansasturf.org/conference/ January 11-12 Washington Association of Landscape Professionals Northwest Landscape Industry Conference Skamania Lodge Stevenson, Washington walp.memberclicks.net/event-calendar January 16-18 National Recreation and Parks Association Innovation Lab: Resilient Park Miami, Florida nrpa.org/events/industry-calendar/ January 24-26 National Association of Landscape Professionals Leaders Forum Hyatt Regency Aruba Resort Spa & Casino landscapeprofessionals.org/ January 29-30 New York State Turfgrass Association Southeast Regional Conference Resorts World Catskills Monticello, New York nysta.org/events/calendar.html January 30-February 1 Mississippi Nursery & Landscape Association Gulf States Horticultural Expo Mobile Convention Center Mobile, Alabama msnla.org/msnla/events/ January 31- February 1 Association of Outdoor Lighting Professionals AOLP Illuminate '19 Embassy Suites by Hilton Scottsdale Resort Scottsdale, Arizona aolponline.org/event-calendar/ February 6-7 California Landscape Contractors Association CLCA Landscape Industry Show 2019 Ontario Convention Center Ontario, California clca.org/lis/lis2019/ February 14 California Association of Nurseries and Garden Centers Nor Cal Landscape & Nursery Show San Mateo Expo Center San Mateo, California norcaltradeshow.org February 19-22 International Erosion Control Association 2019 IECA Annual Conference and Expo Denver Convention Center Denver, Colorado ieca.org/ieca February 19-22 American Society of Consulting Arborists 2019 ASCA Consulting Academy Hyatt Regency Lake Seattle, Washington asca-consultants.org/events/ It's Quick . . . It's Easy . . . It's the . 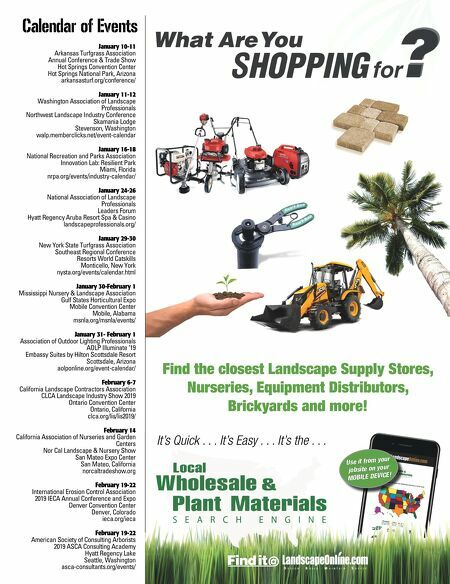 . . Find the closest Landscape Supply Stores, Nurseries, Equipment Distributors, Brickyards and more! 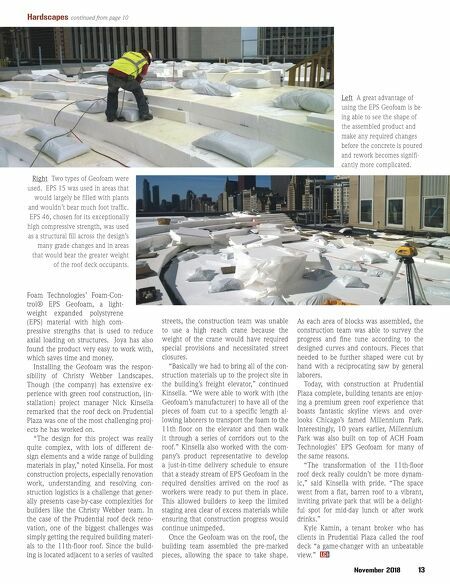 Use it from your jobsite on your MOBILE DEVICE !